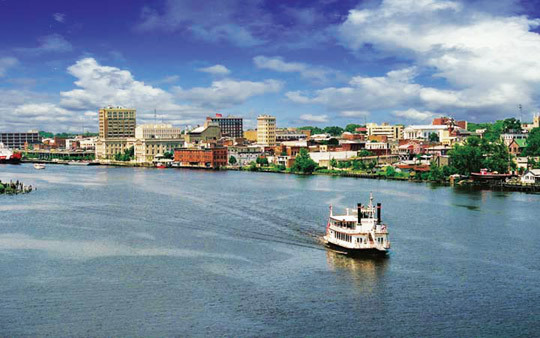 Located in southeastern North Carolina, the port city of Wilmington is located between the Cape Fear River and the Atlantic Ocean. From its Downtown Historic District to the outlying beach communities, Wilmington offers a diversity of places to call home. According to Forbes Magazine, Wilmington is number 32 in their ranking of “Best Places for Business and Careers” for 2010 and Fortune Small Business Magazine says Wilmington is 14th in the nation for “Best Places for a Start-Up”. People are attracted to Wilmington and the surrounding areas for the many cultural opportunities to be found. The Wilmington Symphony Orchestra, Thalian Hall (opened in 1858) and The Red Bard Studio, are only a few of the offerings enriching the area. Downtown Wilmington is a vibrant area in which to live; its restaurants, shopping, nightlife, theaters, and arts provide wonderful culture. There are many residential choices to be found just a short walk from the riverfront. 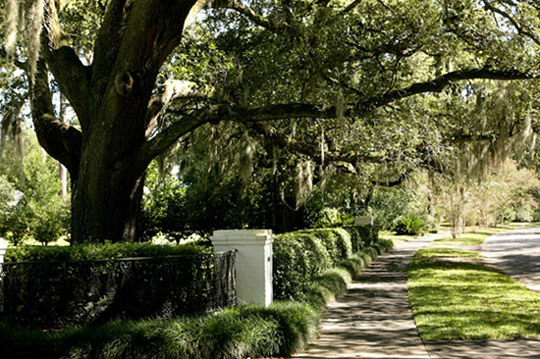 Close by is the Historic District with homes from a by-gone era. With many stately homes and mature trees and cobblestone streets, you will be transported back to a simpler yet elegant time. A number of these historic homes are open to the public for tours. Wilmington is also home to the University of North Carolina – Wilmington (UNCW), which US News and World Report has ranked as one of the top 10 public masters universities in the south for 12 straight years. With over 13,000 students currently enrolled it offers degrees in 52 majors and 35 masters. Look across the Cape Fear River from downtown Wilmington and you will see the Battleship North Carolina, where it has been berthed since 1961. Held in inactive reserve for 14 years after World War II, in 1958 the North Carolina was scheduled to be scrapped. Citizens across North Carolina rallied together to raise money to dedicate the battleship as a memorial to the veterans that served aboard her. Wilmington is host to the various annual festivals. The Azalea Festival, founded in 1948, is a weekly event held each April, showcasing springtime pageantry, Southern Hospitality and family events. Among many other events, Riverfest, first held in October 1979 is a weekend festival held each year to celebrate downtown Wilmington heritage and the Cape Fear River. Outside of the city proper you will find a numerous small and large communities to choose from. Whether you are looking for a single family home with a yard, a condominium or townhouse complex waterfront home or anything in-between, Wilmington has so much to offer. There are many newer home communities as well as older established ones to choose from. Be it a small single family development to a large gated golf community, you will find it all in and about Wilmington. You can find several Planned Unit Developments located in the area, such as Mayfaire Town Center and Brunswick Forest. These are developments with compatible land uses; residential, commercial, retail, and recreational. You can find everything you need in one subdivision: homes, condos, apartments, shopping, office space, etc. Our beach areas boast some of the widest stretches of clean sand on the east coast, drawing locals and tourists alike. Unlike many other beach areas, you will not find sun-blocking towering condominiums and resort hotels, making our beaches reminiscent of the quaint beach communities of the past.